This fact sheet provides information on brain scans and spine scans, including CT scans and MRI scans. This fact sheet provides information on brain scans and spine scans, including CT scans and MRI scans. Our fact sheets are designed as general introductions to each subject and are intended to be concise. There are different reasons for having a brain scan or spine scan and different types of scanner. You should speak with your doctor or specialist for individual advice. Why do I need a brain scan? A brain or spine scan is an investigation. Your doctor or specialist will refer you for a scan and use the results to assist them in making a diagnosis. There are two main types of brain scan and spine scan: CT scans and MRI scans. A CT scan is a Computerised Tomography scan. It is a special type of X-ray using a scanner and computer equipment to take pictures of the brain or spine. It differs from a standard X-ray as it produces pictures of cross-sections of the brain or spine. What happens before a CT scan? You will need to remove glasses, jewellery, hair slides, dental braces and dentures with metal plates before the scan. It is important to tell the staff if you are pregnant or think you might be. You will be asked to lie on a scanner table. You should mention if you are uncomfortable because it is important that you are able to keep still during the scan. When you are comfortable and ready, the staff will leave the room. They will continue to talk with you using an intercom. The scanner table then moves through the scanner to take the first picture. The scanner rotates in small movements around your head to take further pictures. Up to 30 pictures might be taken during one session. A CT scan is a painless procedure and usually takes 20 minutes or longer. An MRI scan is a Magnetic Resonance Imaging scan. It uses strong magnetic fields and radio waves to take pictures of the brain or spine. It differs from a standard X-ray as it produces very detailed pictures of the brain or spine. What happens before an MRI scan? You will also need to remove any loose metal objects like keys or coins from your pockets. You should also take off your watch, leave your mobile phone outside, and leave your bank cards outside because they can be damaged by the scanner’s magnets. If you think you will feel anxious or uncomfortable in the confined space of the scanner tunnel, or experience claustrophobia, you should tell the staff before the scan. You should also tell them if you unexpectedly feel anxious just before you are due to enter the scanner tunnel. When you are comfortable and ready, you will be moved into the scanner tunnel. Staff will continue to talk with you using an intercom. Although an MRI scan is painless, unfortunately, the scanner is very noisy. Each set of pictures takes about five minutes and several sets might be taken during one session. The whole procedure usually takes about 45 minutes. Will I need injections for a CT or MRI scan? For both CT scans and MRI scans, you might need an injection or injections as part of the procedure. This will be discussed with you before your scan. A dye is injected into the back of your hand or into the crook of your elbow and flows around your bloodstream to highlight the blood vessels in your brain or spine. This helps to produce more detailed pictures. It might mean that the procedure takes longer than usual. What happens after a CT or MRI scan? There are no after-effects from either scan so you will not need any time to recover and can resume your normal activities immediately. You should ask the staff in the radiology department about your results. The availability of the results will differ for each individual. For example, they might be sent to your GP, sent to the ward (if you are staying in hospital), or be sent to your specialist. Radiographers: The people who carry out the scan. 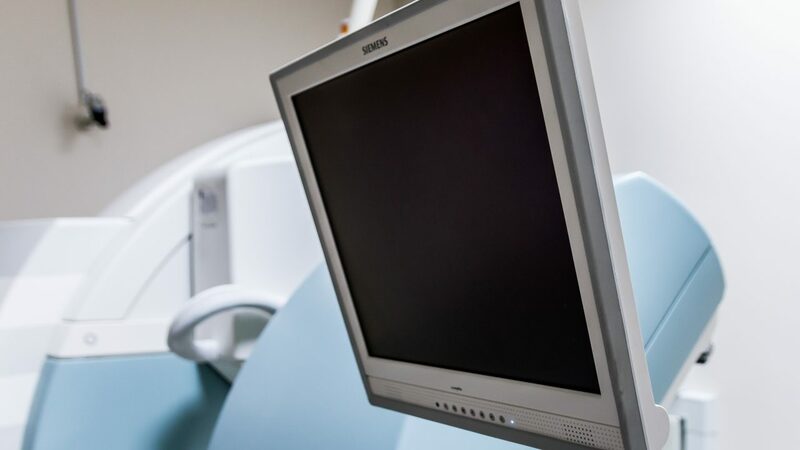 Radiographers are specially trained to use the scanning equipment. Radiologists: Specialist doctors who interpret the scans. Radiologists write reports to be sent to the doctor or specialist who requested the scan. Radiology nurses and Neuroradiology nurses: Specialist nurses working in the radiology department. There are other special types of brain and spine scan. Different hospitals have different scanning equipment and the type of scan you have will depend on your individual situation and what scanning equipment is available in your hospital. Different types of scan are being used increasingly as scanning technology develops. This information was last checked in September 2015. Due for review in September 2018.